At the end of the Second World War Germany was occupied by the victorious Allied forces. Following the Potsdam Conference in August 1945 the country was formally split into American, British, French and Soviet zones of occupation. The former capital, Berlin, was similarly divided. Growing mistrust between the Soviets on the one hand and the American, British and French on the other created a climate of fear where each sides thought the other had expansionist aims. This led to the Berlin blockade of the city's western zone by the Soviet Union in 1948, and the formation of the North Atlantic Treaty Organization (NATO) in 1949. By the end of the year the three Western zones were absorbed into a new state, the Federal Republic of Germany, and the Soviet zone became the German Democratic Republic. 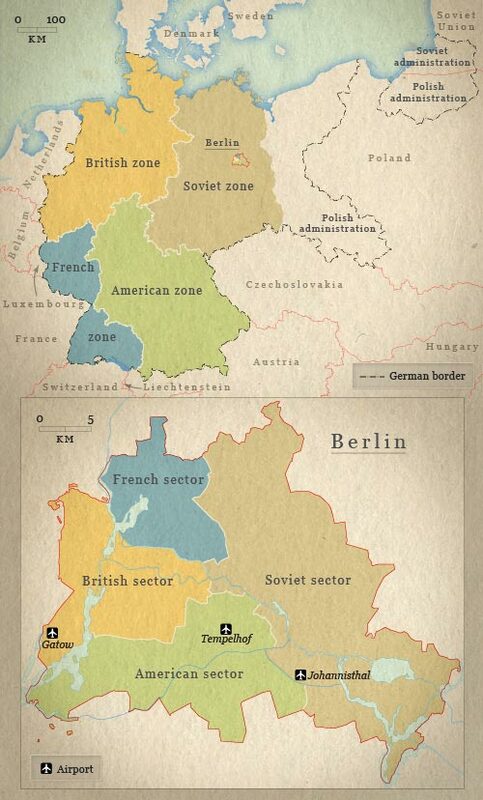 The border between the two countries became the main European front in the Cold War – the symbolic 'iron curtain'. was Germany still a war zone in 1985?